In a Nutshell: Most credit cards are made of polyvinyl chloride acetate — more commonly known as PVCA. The acetate in the cards make them difficult to recycle, as it limits the compatibility with the other plastics blended together at recycling plants. Since the material can be difficult — hence, more expensive — to repurpose, only a few companies work to recycle the more than 10 billion credit, debit, gift, and other cards put into circulation each year. Keith Vorst, Director of the Polymer and Food Protection Consortium at Iowa State University recently sat down with us to discuss the future of recycled PVCA and other plastics that he works with on a daily basis. According to his research, technologies currently under development could one day have companies mining the landfills and oceans for old, discarded plastics. My wallet tends to become a burial ground for useless cards every few months. I typically don’t realize it until there’s a large collection of used gift cards, old hotel room keys, and other various worthless plastic mementos from past adventures. But how worthless are they? They’re plastic, after all. Instead of tossing the collection in the trash to join the billions of other cards headed to the landfill each year, couldn’t they be recycled and turned into something more useful? I found out after researching the topic that recycling old cards — which can also include expired driver’s licenses and credit cards as well as student IDs and other membership cards — is a lot more difficult than you’d think. Keith Vorst is the Director of the Polymer and Food Protection Consortium at Iowa State University. To get more information on the topic, I turned to Keith Vorst, Director of the Polymer and Food Protection Consortium at Iowa State University. Vorst has worked with the institute since 2005 to find new uses for the discarded plastics most people consider worthless. That doesn’t mean traditional PVC can’t be recycled, although most community recycling centers don’t accept the material, which can also be found in plastic pipes, shower curtains, medical tubing, and vinyl dashboards. However, once recycled, it can be ground up and reused to make vinyl flooring, window frames, or piping. Ten billion new cards are placed into circulation every year, but few options exist for recycling the cards once they’ve been used. One such option is Earthworks Systems in Solon, Ohio, one of the largest PVCA and card recyclers in the country, where consumers can send their cards for recycling. The plant currently only receives a small portion of the 75 million pounds of PVCA entering the waste stream every year. The cards Earthworks receives are ground up and repurposed into new cards made from 100% recycled materials. Vorst’s lab at Iowa State receives plastics from companies all over the world that want to test the materials they use to package food and other sensitive goods. Vorst said the process can be difficult, expensive, and not cost-effective for most companies. Iowa State’s Polymer and Food Protection Consortium focuses on developing new materials, as well as systems and methods, for food and industrial packaging while identifying safety and sustainability of goods using recycled plastics. The researchers’ work has led to 11 patents and countless publications of the lab’s work. Despite the success over the last decade, Vorst and his team still have their work cut out for them. The value is determined mostly by the current cost of the materials needed to create virgin plastic, which is currently very low. The dip in price has caused some plastic recyclers across the country to go out of business since they cannot compete. Recycled plastics then become more expensive to create and less cost-effective for companies to use. The added expenses of reclaiming discarded plastic, cutting and grinding it, and transporting it make the material a hard sell to companies working to cut costs and improve their bottom lines. Vorst and his team are working on adding value to discarded plastic by finding innovative ways to extrude the material and keep its properties the same and, in some cases, better than they were before. The lab has recently filed patents showing that some types of recycled plastics block light wavelengths that destroy food, increasing their usefulness to companies that package products with sensitive expiration dates. Other research focuses on technology that Vorst hopes will eventually have companies mining landfills and oceans for old discarded plastics — including those once-useless cards that have been thrown away. 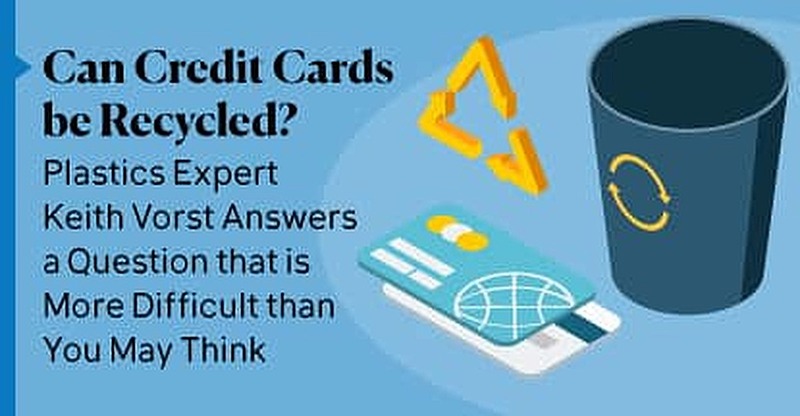 Can credit cards be recycled? Yes — but it’s difficult. The acetate in the PVCA means you can’t just toss them in your curbside recycling bin. If Vorst and his research team have it their way, that could one day change. Vorst said the material can still be compatible with products like a new car’s bumper without impacting its performance. The biggest question Vorst asks, though, is with all the advances in plastics and other technology, why are the credit and other card manufacturing companies still focusing on PVCA? Until that happens the best option for those old cards cluttering your wallet, purse, or nightstand will be to collect them, package them, and send them to a PVCA recycling plant where they will be given a new life — and maybe protect you as the bumper on your next car.